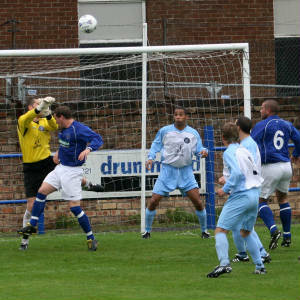 Penicuik were the first to threaten when Barr dragged his strike wide of Wilson’s right hand post. Immediately afterwards Armadale earned consecutive corner kicks. From the first, there were loud claims for a penalty when Bald appeared to impede Johnstone but referee Hogg waved play on. From the second corner Armadale saw a powerful shot blocked and cleared. Then a Johnstone free kick curled over the Penicuik crossbar. In the 9th minute keeper Wilson had to rush from goal to deny Harvey. The same player then saw his shot go inches past the post with Wilson beaten. In the 24th minute, a McCulloch corner kick was completely missed by Bald and MANSON drilled the ball into the net to put Armadale ahead. In their next attack, Johnstone was set free by a long ball out of defence, but Bald came to the rescue to save the striker’s shot. In the 31st minute, a quick break by Armadale set Chilton free on the left, his low cross left keeper Bald stranded and LEE JOHNSTONE came in at the back post to slam the ball into the empty net. However, an instant reply by Penicuik saw Walker head the ball on to HARVEY who coolly slotted home from the left corner of the box. Just before half time, Harvey came close when his shot went narrowly past the post and McCulloch for Armadale struck a speculative 35 yard shot over the bar. The last attack of the half ended when Kelly rose above the Armadale defence, but his header flew inches over the crossbar. Two minutes into the second half and Ryan Johnstone should have added to the score, but missed the target with his strike. Minutes later, Bonnar had a great chance but headed wide of goal from four yards. In the 53rd minute, a Gay free kick went wide of goal. Two minutes later, LEE JOHNSTONE ran the length of the Penicuik half of the pitch to slam the ball past Bald to make it 3 – 1. In the 62nd minute, a long free kick by Penicuik caught the Armadale defence napping and Meikle sneaked in only to send his volley past the upright. Two minutes later, a quick turn and strike by Harvey had the Armadale fans holding their breath as the ball whistled past the junction of the post and bar. In the 79th minute, following some Penicuik pressure, Gay crossed the ball into the danger area but the danger was well defended at the back post for a corner kick. One minute later, substitute Kennedy committed a crucial error when he was dispossessed just outside his penalty box by LEE JOHNSTONE who gratefully accepted the opportunity to complete his hat trick and fairly drilled the ball past Bald in goal. 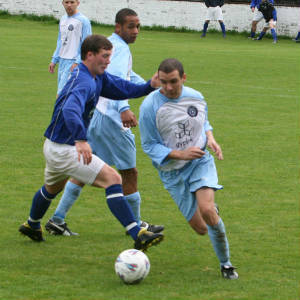 Then, in their next attack, Bald was at his best to beat away a rasping shot by Bonnar. From the corner kick, Ryan Johnstone fired his shot straight into the arms of Bald. In the dying minutes of the game, Buchanan headed a corner high over the bar and at the other end a Harvey header went narrowly wide of goal. 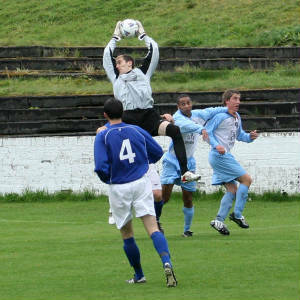 Into injury time, and a superb volley by Harvey saw Wilson scramble across his goal line to pull off an excellent save.